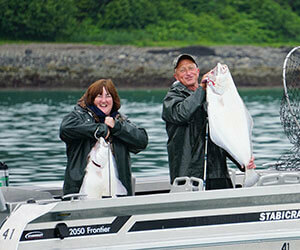 We wouldn’t call it a “Fishing Lodge” if we couldn’t provide the Alaskan Halibut and Salmon fishing experience. At Doc Warner’s, you plan your itinerary. Each day you choose where you want to fish and how long you want to stay at your chosen location. Whether you want to fish one of the 5 nearby streams or on the protected waters of the Icy Strait and Excursion Inlet, the choice is yours to make. King, Silver, Pink, and Chum Salmon and Dolly Varden always offer a good challenge, to say nothing of the rock fish, Pacific cod and other sea creatures vying for your attention (and eating your bait). 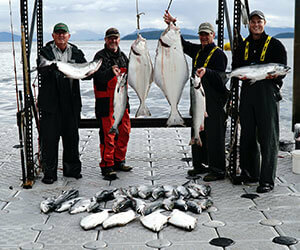 With all these fish, you are virtually guaranteed a successful fishing experience. The only major consideration when planning your Alaskan Halibut and Salmon fishing trip is what type of salmon you are most interested in catching. Use the information below to choose the species you’d like to catch. 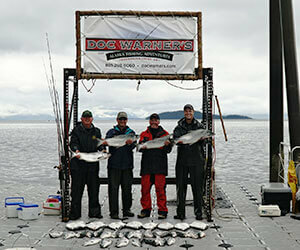 Once you’ve made your decision on what you want to catch, you are ready to schedule your trip to Doc Warner’s. 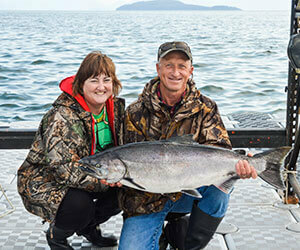 King Salmon in the 20–50 pound range can be thrilling. Kings are most prevalent from June to early July. Silver Salmon are very acrobatic, often thrusting themselves skyward as they try to dislodge your hook. Silvers are available from July through September. Pink Salmon are the most plentiful of all the Salmon. Pinks can be found all season with the heaviest time being June to mid–August. The greatest variety of Salmon can be found anytime during July. This includes Kings, Silvers, Pinks, and Chums. Fly fishermen often prefer to fish the nearby streams which are loaded with Pink, Chum, Sockeye, and Silver Salmon and Dolly Varden starting in late July through September. Halibut are strongest and hungriest in the early summer, June-July. However, they are always present and will give even the most experienced fishermen a run for their money. Other species of fish include Pacific Cod and Rock Fish (several varieties). These are available all season.